Christmas just keeps getting better and better with kids! Hailey was really into Christmas this year and Santa (even though she wouldn't sit on his lap). She had a great time opening all of her presents and waited ever so patiently for her turn at all three houses (both grandmas and ours) where she opened even more presents. She asked sweetly each time, is it my turn yet (again)? Favorite presents were probably anything to do with Mickey Mouse and the Hatchimal that her Grandma found for her because if her sister had one then she had to have one too. Peyton loved seeing where our elves ended up each morning during the Christmas season. But, she wasn't sure she was going to get presents this year as she was undecided if she was good enough to deserve them! 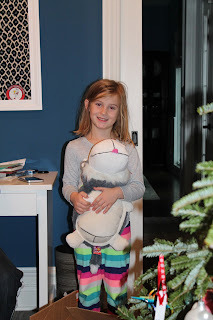 So she was very excited on Christmas morning to discover lots of presents to her from Santa (after all we couldn't scar the child two years in a row after forgetting her Santa presents last year and having to have the "elves" deliver them later). Favorite presents were probably her Hatchimal that Grandma scored on an early morning Toys R Us/Walmart run and then her Flip A Zoo stuffed animals. Go figure. I think we really relished Austen's possible last year of believing... or really of all three of our kids believing at the same time. He's started to ask me lots of questions like how could I have the receipt to one of the presents Santa gave him (I honestly don't remember what Santa gave him and what we gave him, but he does!). How can Santa possible fit all those toys in his sleigh? Why are there tags from stores we shop at on some of his Christmas presents (no, I don't always remove those! But that Sears commercial really came in handy where they show the elves shopping at stores!). How does Santa deliver presents to everyone all around the world in just one night (time zones, what'd he think?!). Not sure how many more straight faces I can keep as I answer him! Favorite presents for Austen was his Xbox video game system (that I said I would never buy) and all his Lego sets (that I said he can't have anymore of!). As for Sadie's first Christmas, we sent her on vacation for a few days to her breeder for boarding while we spent extended hours at our families for Xmas Eve and Xmas. We didn't know what kind of damage she would do being left alone as a 10-month old puppy for up to 8-9 hours each day and thought she'd have more fun romping around with some playmates. She came back exhausted as well as nicely groomed! I can't believe Christmas is over for this year but I'm sure glad the radio stations are still playing Christmas music so I can ease myself back to reality. It's been an exciting week of soccer. Hailey finished up her last soccer skills class for 3-4 year olds before the break. She just moved into this class without parent involvement and has done remarkably well listening to the coach's directions and competing with mostly boys in her class. She can dribble the ball pretty well for a girl who just turned 3. And, I taught her just once not to use her hands to get the ball out of the net but rather roll it back by placing her foot on top of the ball. She looks like a superstar out there doing just that, running and scoring. Maybe she's following in her big brother's footsteps! Speaking of Austen, he may have just had one of his best soccer seasons yet. He's been a monster scoring at least one goal in every game and sometimes five to lead his team to a first place playoff berth. His skills have improved dramatically and he is throwing moves I've never seen before. His intensity has also increased which means he rarely gives up even when his team is down. His tenacity was evident during the playoffs this weekend when he had just an okay game first round even though he scored an awesome goal in the last 5 minutes. Heading into the championship, I let him know his team needed him to play not his usual 100% but 150% if he wanted to win since his team was missing some key players and now they were up against a tougher team. He answered with some great defense, assists and a goal to claim the first place spot. His smile was as big as could be and I was so proud of him for digging deeper to be a leader in his actions and words on the field. This kid has potential. I saw it at a young age but seeing his development into an even better player has been a joy to watch. Next up for his team is dominating during the next league play and traveling to Florida to compete in an international tournament. What a lucky almost 10 year old! Sledding in a Winter Wonderland! It was our second snowstorm on Sunday and even though the roads weren't great the temperature outside wasn't too cold so we loaded the family into the car and went sledding. There were some really funny moments from our hour on the sled hill. This is my favorite one - typical brother! Hailey was also adorable - making snow angels and loving sledding down the hill (sometimes insisting she was going by herself). She loved being outside and kept her mouth open to catch the falling snowflakes on her tongue. She also didn't complain about walking back up the hill! Big bonus for us because we didn't have to carry her every time or pull her back up in the sled. Since Hailey didn't seem to mind the cold, we may try to get her to ski this year. Austen was 3 when he first hit the slopes. Could it be that I may be able to ski again soon after a 10-year hiatus due to kids? If so, I see some really fun trips in our future! Sadie was born Feb. 28, 2016 so she probably doesn't remember snow last year. Therefore, this year was her first real snow. She didn't know what to make of it at first. She stood there sniffing it almost paralyzed in the heavy, wet snow that enveloped her paws. Then she did what she usually does - she started eating it. Mouthfuls. Upon mouthfuls. After her belly grew full, she started running. Oh what fun it is to frolic through the snow, she found out. She knocked Hailey down more than once as she played crazily in the yard. She stole her gloves and delighted in us chasing her around the yard trying to retrieve it before she decided to eat it. Like Adler, Sadie who never did like the sun, loves the snow. She'll go outside run around and lay it in it for hours. All that fresh air certainly tires her out but not enough to stop her from stealing the ornaments off the tree and running under our long dining room table with them so we can't get her! Sadie is definitely getting coal in her stocking this Xmas!